Sarkar Aapke Dwaar (government at your doorstep), which is a government programme to take various public welfare services of the central and state governments among the rural people of the state, on Tuesday reached Depi village in Ruksin circle under East Siang district of Arunachal Pradesh. The area shares border with Dhemaji district in Assam. The ‘Sarkar Aapke Dwaar’ programme was conducted by the East Siang district administration at Depi village under the ‘Jan Sunwai Sammelan’ of the state government. Attending the inaugural programme, the MLA of Nari-Koyu LAC, Kento Rina said the state government has made efforts to bring its departments among the rural people and asked them to avail various services and benefits rendered by the departments through the mobile programme. “The government departments through the mobile programme to deliver services such as collection of ST certificate, PRC, ILP, renewal of gun licenses and other scheme benefits under various departments at the spot,” said MLA Rina. 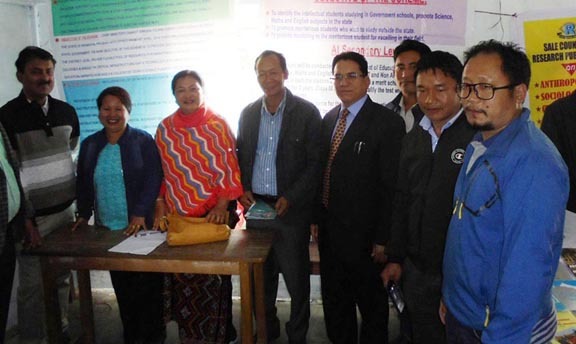 East Siang deputy commissioner Tamiyo Tatak, who inaugurated the programme at Depi Upper Primary School on Tuesday, instructed local gaon burhas to help the local villagers to get benefits of schemes from various departments through proper identification formalities. Following a public demand, DC Tatak announced sanction of Rs 20 lakh through his ‘Untied Fund’ for renovation of worn-out school building of Upper Primary School and Girls Residential School at Depi besides construction of toilets therein. Various departments including medical health, agriculture, industry, financial banks, power, education, food & civil supply and other engineering departments placed different stalls and delivered public services in the day. Thus, local administration issued certificates of income, birth & death, permanent residence and Scheduled Tribe certificates to the applicants; heath department staff conducted free health check-up and sugar tests on the occasion. The medical officers also informed the people about flagship schemes like Dulari Koniya, Chief Minister Arogya Arunachal Yojana and Ayushmaan Bharat with the scheme benefits. Women & child development and education departments explained the people about their social welfare and community health service schemes with distribution of information leaflets. Moreover, District Legal Service Authority of East Siang explained various free legal services for the poor people through displaying their service outlines, while officials of Legal Metrology department demonstrated various issues pertaining to consumer awareness during the programme. East Siang district administration so far has conducted 17 such camps under its ongoing ‘Jan Sunwai Sammelan’ programme covering all administrative sub-divisions, block and circles under East Siang district. Earlier, other district in Siang belt of eastern Arunachal including Upper Siang, Siang, West Siang and Lower Siang also launched such Jan Sunwai Sammelan as their officials outreach programme. The programme will be continued till ending of March this year.